The U.K. doesn't yet know what Brexit means, what economic impact it will have or how to execute it. These are the big takeaways from a week of turmoil that prevented Prime Minister Theresa May from unlocking the second phase of Brexit talks about the future terms of trade between the U.K. and the European Union. 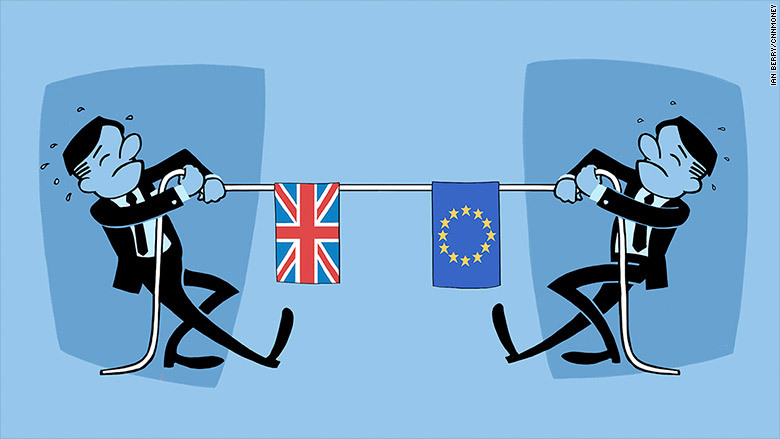 Negotiations continue, but time is tight: Britain will crash out of the EU if no deal is agreed by March 2019, an outcome that the U.S. Chamber of Commerce warned Wednesday would be "devastating." Businesses are preparing to move jobs and investment out of the U.K. in early 2018 if trade talks haven't started. Nervous investors have pushed the pound down against the dollar this week. The biggest question Britain must answer is what kind of relationship it wants with the EU, its biggest export market, once it has left. May has made clear that the U.K. will leave the EU's internal market and customs union. But beyond those red lines, little has been settled. Britain must decide whether it wants to negotiate continued easy access to EU markets or accept significant barriers to trade. Both scenarios come with economic risks, and political consequences, that are bound to upset factions within May's own party. Settling on a preferred course of action has been made more difficult by the fact that her cabinet, which has different views on what the "end state" should be, has yet to debate the issue. "We have not had a specific mandating of an end state position," Treasury chief Philip Hammond said Wednesday. One example of the resulting confusion: Hammond also said it was "inconceivable" that Britain would walk away from the EU without settling its financial commitments -- in effect, paying a divorce bill that could run to tens of billions of euros. The prime minister's office countered quickly, saying that "nothing is agreed until everything is agreed" with the EU. The risks of putting off the decision too long are profound. Crashing out of the EU without a deal could mean grounded flights, rotting food at the borders and a shortage of parts for automakers in the U.K.
Britain's top Brexit negotiator David Davis said Wednesday that his department has not studied how leaving the EU would affect specific sectors of the economy. "I think ... there's no systematic impact assessment, no," he told a parliamentary committee. Davis defended the government's preparedness, arguing that such studies would "not necessarily be informative" and that their usefulness would be "near zero." "You don't need to do a formal impact assessment to understand that if there is a regulatory hurdle between our producers and their market, that there will be an impact," he said. Hilary Benn, a member of the opposition Labour Party, said it was "extraordinary" that Davis had not analyzed the economic impact of such a major event. Davis said his department had studied the size and scope of industries -- but had not tried to assess how their performance would be affected by Brexit. Consulting firm Oliver Wyman says 75,000 finance jobs could be lost in the long term if there's no Brexit deal. Britain's automotive industry has warned that the price of cars imported from Europe would go up by £1,500 ($2,000). May failed earlier this week to move Brexit negotiations on to the critical issue of future trading arrangements. 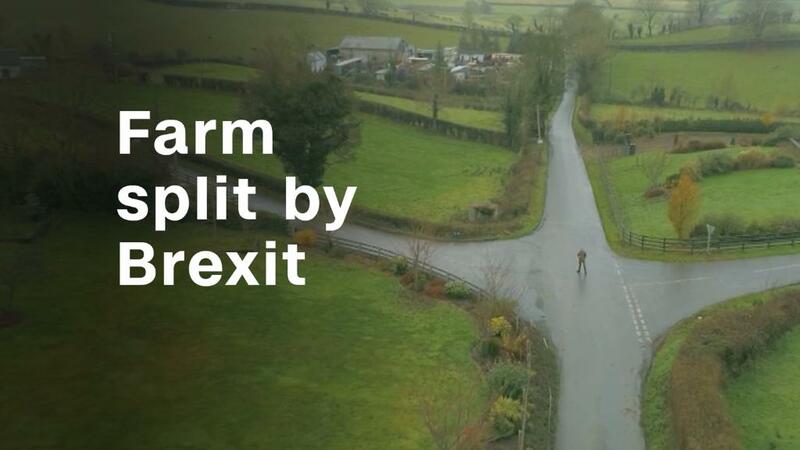 The prime minister hoped to convince the EU that hard barriers would not return to the border between Ireland and Northern Ireland after Brexit. The deal was scuttled after Northern Ireland's Democratic Unionist Party (DUP), which props up May's minority government, objected. The episode underscores the difficult balancing act facing May. Her political party is divided on Brexit, and she must keep the DUP happy in order to prevent her government from collapsing. 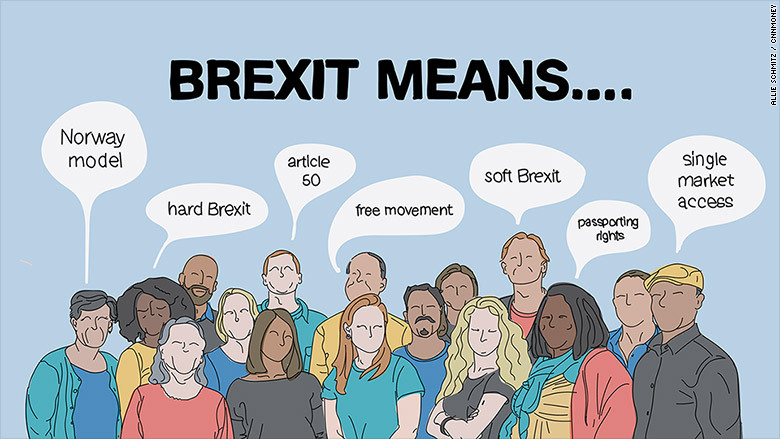 In addition to the Irish border and the divorce bill, the rights of EU citizens that live and work in Britain, and the rights of Brits who live in the EU, must be settled to the satisfaction of all 27 remaining EU members. Only then can talks move onto trade. That may not happen now this year.